Grab a map, some bug spray and your hiking shoes, it's time to hit the trail! In 2016, Viamede Resort partnered with the Kawartha Land Trust to expand the trail network that runs through and around the property. 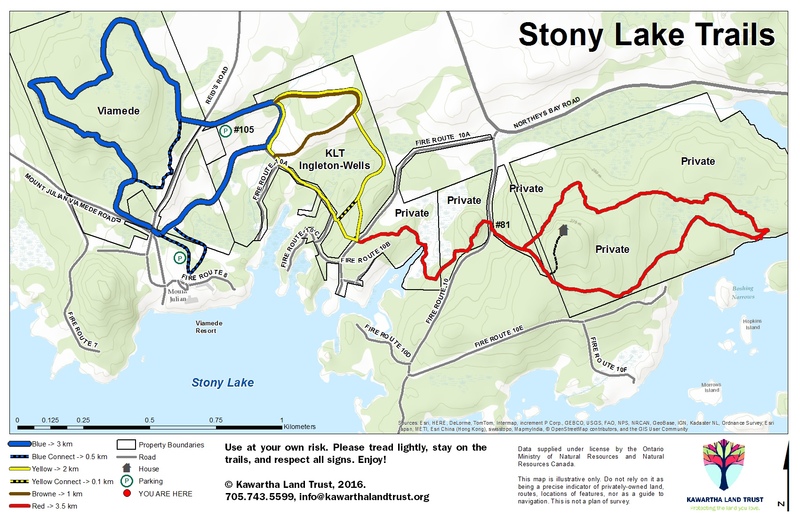 The 9 kilometres of trails are arranged into 3 major loops – the blue trails (3.5 km), yellow (2km), and red (3.5km), and are open to hikers, cross country skiiers, snowshoers, dogs and people. Using a mix of land owned by Viamede Resort, Kawartha Land Trust, and various private land owners, the trails include Canadian Shield, limestone formations (The Chute), wetlands and a beaver dam. The Peterborough Disc Golf Club built and maintains a challenging disc golf course on the Viamede property running through forest trails. All trails are used at your own risk. No overnight use, fires, or alcohol are permitted on the trails. The township requires that dogs are kept leashed on the trails. Please clean up after yourselves, your dogs, children, and husbands. Please do not collect any animals or plants from the trails. Please help us keep the trails clear – if a branch has fallen on the trails, please move it to the side. There are many old trails branching off the coloured loops – at each intersection, please keep an eye on the markers. Please do not stray from the marked trails as some others lead onto private property. Maps: want to know the best place to view salamanders, where to find the Viking Oak, or where the nearest lunch stop is? Check out our handy map below! You can turn layers on and off, to focus on wildlife viewing hotspots, landmarks, and other interesting features.